Ms. Kaye started riding in Singapore in southeast Asia at the age of 11 by taking lessons at the local Pony Club which offered instruction in English riding and jumping. Her favorites were two ponies named Lulu and Nikki and her love of ponies was born. Upon returning to the United States, Kaye continued to ride and train with local English trainers gaining experience in dressage and jumping and then Western Pleasure riding and barrel racing as well as giving lessons to others. She got her very own horse when she was 16. At the age of 20 she started working with a local pony party company, and then started Pony Tales which she has been running ever since. She has continued her own learning by taking lessons from instructors in many different places with the idea that learning never stops. About 10 years ago, Kaye came across the natural horsemanship teachings of Monty Roberts and John Lyons which stresses understanding, patience and true communication with your horse and she realized that she had found the missing piece in her training. Our lessons are tailored to the person in front of us whatever your age (3 and up) and experience and goals. Our specialty is beginners and also anyone with a fear of horses who wants to get over it. Where many instructors would rather teach someone with experience, teaching beginners is our pleasure! Our one main requirement is that the person taking lessons actually wants to be there. Lessons are by weekly appointment only, anytime from 8am – 7pm, M-F.
We will occasionally schedule lessons on the weekend. 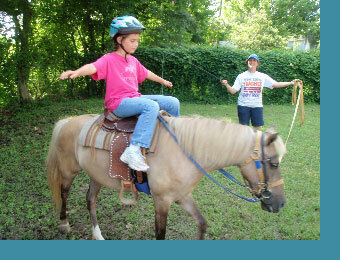 1st Orientation Lesson $40 one hour ground work and intro to riding. All riders start with privates until they can competently make progress in a group. We want quality as opposed to quantity and I want your basics in right! The lessons start with grooming the pony or horse. We teach how to handle them on the ground, and about how a horse thinks. 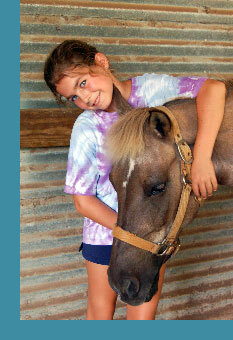 We teach all aspects of horse care so that if you ever want a horse, you will know what to do. Most importantly, we teach you to respect and understand your horse so you both benefit. We expose our students to both English and Western riding (a balanced seat), carriage driving and explore other forms of riding and then concentrate on what they want to learn. At the point where they are ready for more advanced riding or to specialize, we help them find another instructor they are happy with.